I see from your website that Thomas Bletcher was admitted to Mansfield General Hospital following an accident at Welbeck Colliery on 8th December 1955 in which he sustained a broken pelvis. I know that he died in 1956. I'm trying to help a friend to trace her family tree. Thomas was her grandfather and she would love to know the circumstances of the accident and his subsequent death. Do you know if there are any records anywhere to explain what happened? In our records, i.e. Alan Beales and Bob Bradley on the site, we have the date of the accident as 8 Dec 1955 and after admittance to hospital he died on Christmas Day 1955. He was caught in some machinery underground and sustained a broken pelvis. It would appear that complications arose unfortunately resulting in his death. The inquest was at Mansfield Police station in 11th February 1956. If you have his death certificate, if not, send for it, and it will state what he died of and probably the circumstances leading up to it. Unfortunately these type of records are rarely kept following the closure of the pit, however it will be listed with the relevant information in the HM Inspector of Mines reports. I have just received the death certificate of my great grandfather who we have just found out died in Frickley Colliery, South Elmsall, Barnsley. 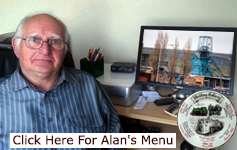 We are not sure what he was doing there as he lived in Stoke-on-Trent. His name was Thomas Smedley and he died 3rd December 1909 due to being crushed by a fall of coal from coal face in said pit and died instantly this adventure. Certificate received from Walter Blundred, Coroner for the Honour of Pontefract, inquest held 6th December 1909. Is there any way we could find out where he was staying before he died. Hello at the start of 1991 a contractor named Ross Parkin was killed on 221s face chock salvage where he was crushed to death by a lowered powered support. I was the deputy in charge, Ian Harris. He was killed immediately. Inquest at Mansfield Civic Centre. Also David Hardy was crushed when trying to load an old Dosco track section. He was my neighbour and my dad helped carry his body out. David was crushed under a Dosco track section he was loading. He was asked to do so by the then undermanager Steve Parkin. David was out of his depth and it was because of this people had to do a heavy and awkward load course before they were allowed to handle items like this again. It was David's 18th birthday that day too. David was a really good lad. Val is a great lady, as was his dad Roy. His surviving brother Kevin is a decent man too. I came across your site quite by accident. My dad was a miner in Pilsley and then New Hucknall until he retired in 1979. His name was John Revell and he had a good retirement and died in 2004. His widow is still alive. 01-08-1896 Unknown Tibshelf A boy Drowned in pit reservoir. My grandfathers much older half brother was Charles Revill (the name change every generation) and he was born in 1878 and drowned at the age of around 20. Charles is listed as a pony driver in the census when he was 15 and his brother Jonathan as a pony driver aged 13. I assume they were at Tibshelf pit but I do not know for sure. I wonder if this is the unknown person? He lived at Sunny Bank Tibshelf and his father was John Thomas Revill from Doncaster. I went to visit Sunny Bank at Tibshelf and there is a big fishing pond very near to it. I'm not sure if the dates tally as I have his death as 1900. A group of us are researching the lives of men who died in our parish of Sitlington (Wakefield area) during World War I. 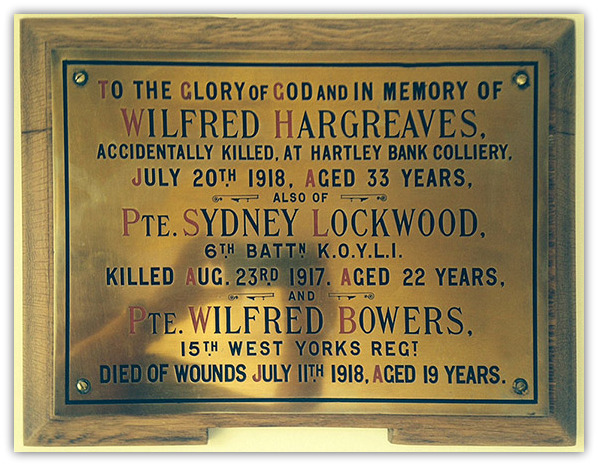 In Trinity Methodist Chapel in Netherton is a small memorial to three men - I attach the photograph. So far we have been unable to track down any mention of the mining accident for Wilfred Hargreaves. We have tried the local newspaper - Wakefield Express and would you believe we live on the doorstep of the National Mining Museum, but still can't trace anything to do with the accident. Please can you help? We do have some info from birth, baptism, census and marriage records which we would happily share with you if you wish. Happy to report that I have made some progress on tracking down Wilfred Hargreaves. In fact there was an account of the inquiry in the local newspaper. Happy to share this information with whoever you think most appropriate. I know know that he was buried in Thornhill Churchyard (near Dewsbury). In fact I went there this afternoon. There is one part of the cemetery that is devoted to miners killed in a large accident (1920 I believe) I suppose that I shouldn't be surprised that he wasn't in that part and there wasn't a gravestone for him. So, I attach the newspaper clipping in two parts and a transcript of the same plus the memorial plaque from the entrance to Trinity Methodist Church in Netherton. An accident happened at Hartley Bank Colliery on Saturday afternoon, Wilfred Hargreaves, age 33, foreman deputy there being fatally gassed. 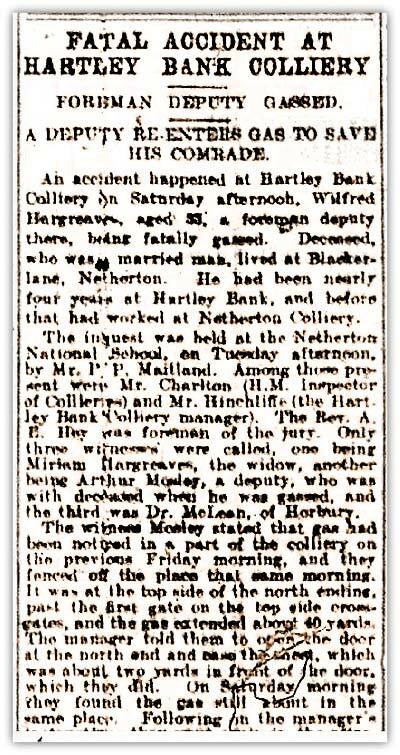 Deceased, who was a married man, lived at Blacker Lane, Netherton. He had been nearly four years at Hartley Bank and before that had worked at Netherton Colliery. The inquest was held at the Netherton National School on Tuesday afternoon by Mr P.P. Maitland. Among those present were Mr Charleton (His Majesty’s Inspector of Collieries) and Mr Hinchcliffe (the Hartley Bank Colliery Manager). The Reverend A.E. Hey was foreman of the jury. Only three witnesses were called, one being Miriam Hargreaves, the widow, another being Arthur Morley a deputy, who was with deceased when he was gassed and the third was Dr McLean of Horbury. The witness, Mosley, stated that gas had been noticed in a part of the colliery the previous Friday morning and they fenced off the place that same morning. It was at the top side of the north ending, past the first gate on the topside cross-gates and the gas extended about 40 yards. The manager told them to open the door at the north end and case the sheet, which was about two yards in front of the door, which they did. On the Saturday morning they found the gas about in the same place. Following the manager’s instructions, they went again in the afternoon, about three o’ clock when the pit was not working to do certain work in connection with the doors and sheets. To carry out those instructions they would not have had to go into the gas. They finished their work about 4.10 o’clock and then rested a quarter of an hour, waiting to see if the gas cleared off. They then went up as far as No. 2 gate by the cross-gates to see whether the gas was shifting. They found gas at the top side of No. 2 gate, testing it with their safety lamps. Hargreaves said “shall we try to remove the sheet on the topside of the cross-gate?” and witness replied that he had no objection to their having a try. Witness also said he would go first and accordingly made his way, a distance of about 30 yards to the sheet. He got hold of the sheet, but could not pull it loose for it was of several thicknesses. Finding he was getting overpowered, he moved back about three yards, with his face to the floor to get some fresh air. The road was about 3 ft. 6 ins. high and they had to move stooping. Hargreaves had come up and was then passing him. Witness told Hargreaves he was only resting half a minute and then he would have another try. Hargreaves replied “Oh I’ll have a try at it Arthur”. Hargreaves then had a try at the sheet, but failed to pull it down, and he said “my word, its strong here Arthur”. Witness remembered nothing more until he recovered consciousness and looked at his watch and found the time was 7.30. It would have been 4.25 when Hargreaves passed him to have a try at the sheet. When witness roused, the air was not very much purer and at first he did not know where he was. He then saw the two electric lamps burning near him. He made his way to the north end gate about 50 yards away. The air was pure there. Witness remembered he had been working with Hargreaves and wondered if he had been unconscious too. Witness went and got a tram and then went back with it to where they had been working and noticed the gas was very strong there. He found Hargreaves unconscious in a kneeling position with his head on his hands, which were resting on the floor. Witness was overcome about three or four times before he got Hargreaves on the tram. There he succeeded in getting him to the bottom of the cross-gates and tried artificial resuscitation for about three quarters of an hour, but without success. Witness then went to the pit bottom to tell the engineer what had happened and assistance was fetched. The Coroner there is no doubt when you came round after those three hours and gradually realised that your mate was missing and determined to go back and face this gas, your conduct in that respect was wonderfully brave. Of course you took your life in your hands. There is great credit due to you, I think, in that respect. The foreman of the jury said they concurred in their opinion as to the courage shown The Coroner: Yes his conduct in going back to find his mate was excellent. H.M. Inspector also put a number of questions to witness. As between the two, witness said Hargreaves was the chargeman, but had he thought he was doing anything foolish, he would have told him so. On a previous occasion they had got rid of the gas on the lines suggested by the manager similar to his instructions in the present case. H.M. Inspector: As a matter of fact the gas has gone now? H.M. Inspector: And the sheet is still there? In further reply to the Coroner Witness said they were not missed as they had not told the engineman what they were going to do and had said they might be some time. In answer to the manager, witness said the manager’s instructions were that no one was to go into the gas. They had to do certain work which would not take them into the gas, and then on the Sunday morning, the Manager would come in good time to be with them and see how it was getting on. Dr McLean said he had seen Hargreaves dead body at 10 o’ clock on the Saturday night. A post-mortem examination showed that death was due to Asphyxia. After one or two breaths of the gas, deceased would have become absolutely unconscious. The doctor added that in such cases artificial respiration was no good. The veins were engorges and the best thing would be to make an incision in a vein with a sharp penknife and let out some of the blood. After that they could try artificial. The Coroner said that he thought the accident arose through excess of zeal in trying to get the work completed, instead of waiting according to the instructions. The jury returned a verdict that the deceased had been accidentally suffocated by inhaling gas whilst unwisely trying to pull down a sheet, from an inhalation of gas. The manager then on behalf of the Flockton Coal Company and himself then expressed sympathy for the widow and family and other relatives, and said that Hargreaves was a man they admired and trusted. Undoubtedly over zeal in his work had brought about his death.